Children’s snacking habits are influenced by their immediate food environments. Increasingly, findings show that factors such as corner stores near schools are related to obesity. This study was conducted in preparation for a larger, community-based participatory research project to create "healthy snacking zones” near schools in a rural Oregon county. The objective was to assess healthy snack availability in stores located within a half mile radius of high- and low-income elementary and middle schools in Portland, Oregon. 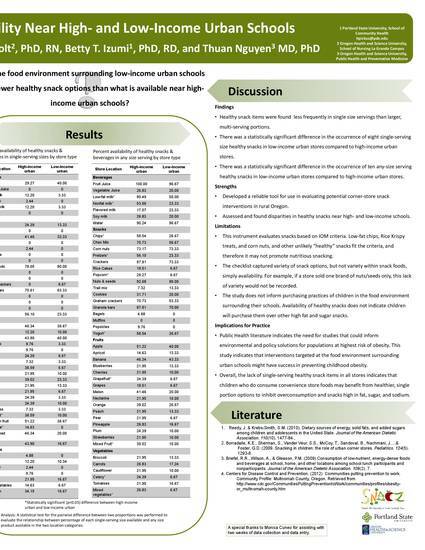 Using Geographic Information Systems, convenience and food stores were selected and classified as either high- or low income based on % eligibility to receive free or reduced-price lunch at the proximal school. The SNACZ food store checklist was used to evaluate availability of 50 healthy items in single- and multi-portion servings at these stores. A statistical test for the pairwise difference between two proportions was performed to evaluate the relationship between percentage of each single-serving size available and any size product available in the two location categories. Of the fifty snack items, statistically significant differences in availability between high- and low-income stores were found in eight single portion items, and ten items of any size. Single portion snack items were found less frequently than multi-portion items in both high- and low-income stores. Overall, the lack of single-serving healthy snack items in all stores indicates that children who do consume convenience store foods may benefit from healthier, single portion options to inhibit over-consumption and snacks high in fat, sugar, and sodium.